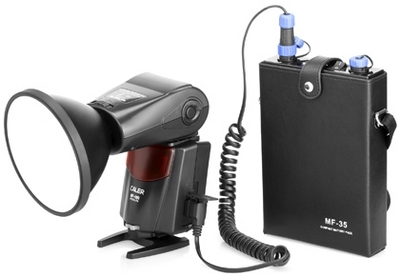 The Caler Mini Flash MF-100 is a high-powered hotshoe flashgun from Jinbei that runs off an external battery pack. It has a "bare bulb" and removable reflector, putting it halfway between a studio head and a system flash. The Jinbei MF-100’s resemblance to the Qflash series by Quantum, an American manufacturer, is uncanny. It even has similar nifty gizmos like built-in radio receivers. Unlike those products, however, the MF-100’s feature set is more basic. 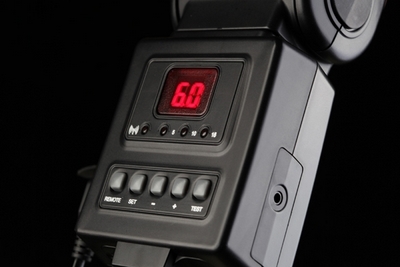 Power must be set by the user – there is no TTL – and the LCD screen is more retro. There are six stops of intensity adjustment and a stroboscopic mode. The maximum recycle speed is specified as 1.2 seconds. Powered by the nickel-metal hydride MF-35 Battery Pack (12VDC, 3500mAh), Jinbei claims you can fire off 1500 full power flashes before needing to recharge. 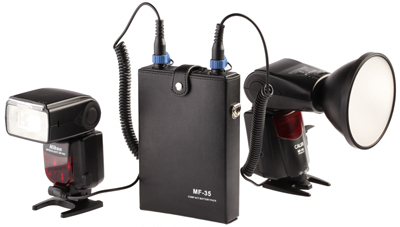 The MF-35 can also be used as an external power source for Nikon and Canon speedlights with the appropriate cable. There are two output sockets which you can use simultaneously. So, why get one? The main benefit is the bare flash tube which provides a 360° spread of light, better suited to filling softboxes than the narrowly-focused beam from conventional system flashguns. The MF-100 is small enough to work with “Strobist”-style modifiers, such as the speedlight softbox portrayed below. It’s not clear how the built-in 2.4GHz remote control will be implemented. Will Jinbei give you wireless control of power settings? Or will it just be compatible with their new TR-series radio trigger? 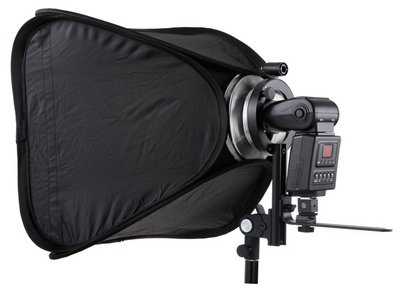 Update: The Jinbei Mini Flash is now on sale, listed by ThePhotoGadget for US$348. Quantum Instruments did not respond to our request for a comment.